Wine and me, we’re pals going waaaay back. When I saw a Tweet a few weeks ago inviting food biz people to the Discover BC VQA wine tasting event, I thought, “why not?”. 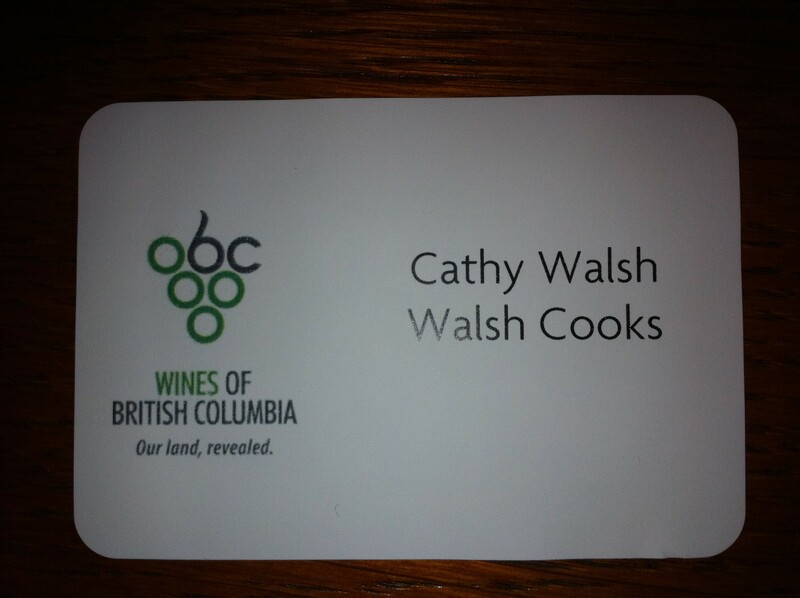 So I RSVP’d with great delight and anticipation about trying new wines from BC. Which, I have to say, even though I have wine flown in from around the world on a monthly basis and can’t seem to stop it (I can’t say I’m trying too hard either), BC is my favourite wine producing place on Earth. Plus, I don’t have to sit 9 hours in The Middle Seat to get to a vineyard for the full wine-growing-producing-sampling-eat-with-local-food experience. Now, this enthusiasm, this zeal, to taste some delicious BC wines happened a few weeks before Thanksgiving, a weekend of limitless food, rich food, and a fair share of wine – Mouton-Cadet Bordeaux I kid you not. It was a gift, and it was just fine and dandy. Today dawns, the day of The Wine Tasting, and me, who is of an age and fitness level where I inwardly groan when I drop something on the floor and wonder if it would be satisfactory to give it a little kick, a gentle kick so not to irritate the damaged knee, into a dark dusty corner under my desk and just forget about it, was mildly concerned if I would have the energy and desire to face the tasting. I got through the day though with just a mild suffering of post-turkey blues, and pants became too snug overnight. I’m a trooper. Wine is one of the healthiest things I do to my body. So what the hell? I went. I arrived at the Winspear Centre, checked in, happy and relieved to find my name-tag in among professional people who buy wine for people like me. It was cool to have the experience to learn about wholesale prices, the business (read headache) of moving wine across provincial borders, and to meet a bunch of enthusiastic reps. I was leery of the reps who didn’t have a glass firmly placed in front of themselves and tasted along with me. Just saying. I’m sure they are outstanding, responsible people though. 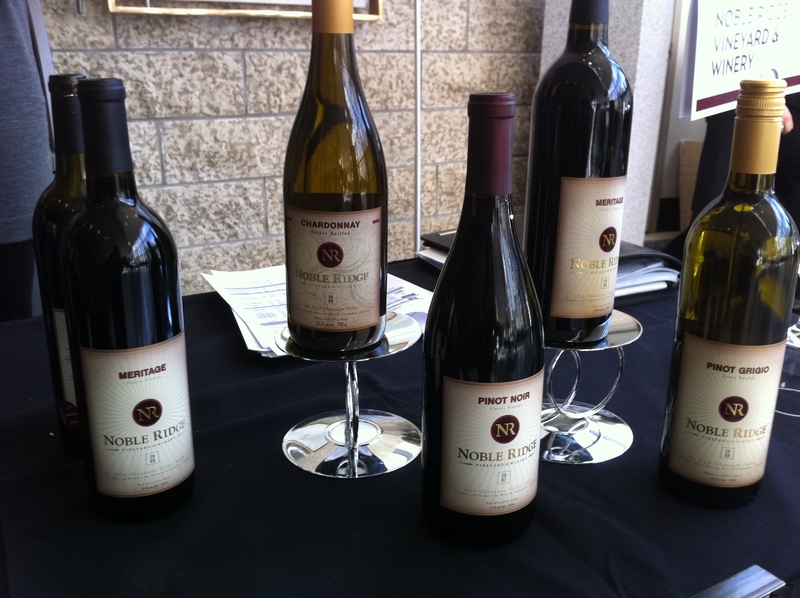 My first stop was Noble Ridge, and as form dictates, started with the whites. A chardonnay. 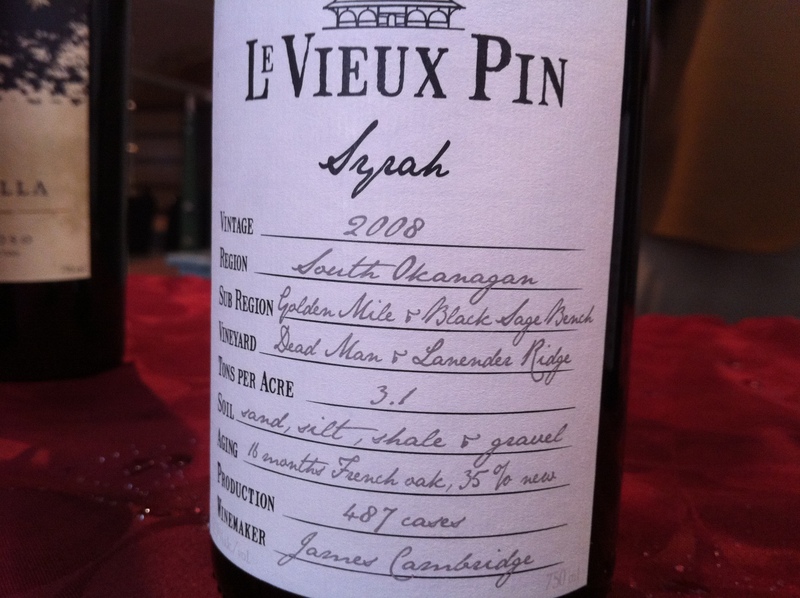 A wine I am not too fussy about, but this chardonnay was delicious, clean and not oaky as chardonnays of old were made. A few stops here and there, and to my great delight ran into Andrew, ANDREW whom I am completely smitten with who was, and still does, some tastings at The Bothy. 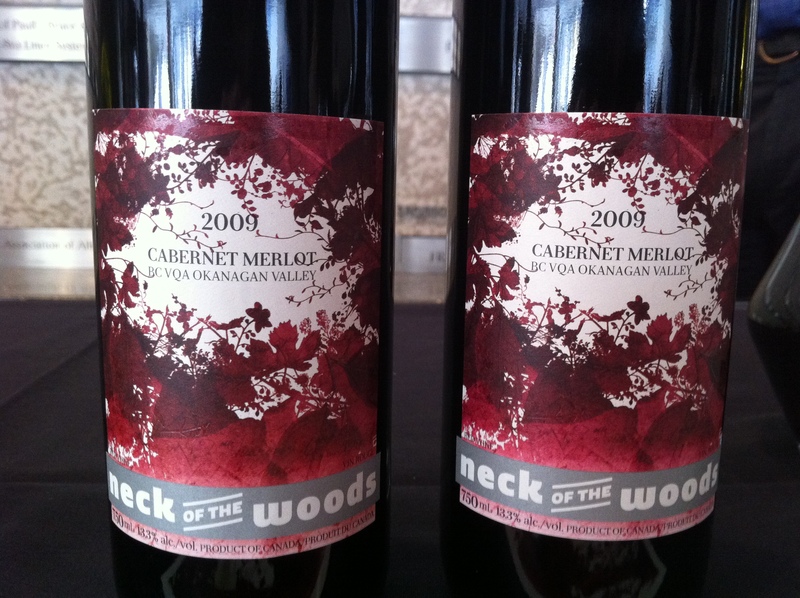 Andrew is freelancing at the moment for Purple Valley Imports and was sampling some lovely Cabernet Merlots from Neck of the Woods. But he could have served me rain barrel water, complete with dead mosquitoes and I would have loved it. The man has a way with romancing the wine. Seriously, though, the wine was delicious. I am not a swish and spit wine taster. I drink the stuff because that is what God intended. But with that in mind, I had to restrain myself. I did not try every sample available, and even used amazing willpower and resolve to take one dainty sip and splosh the rest in the discard bucket. Some were easier to splosh than others. Surprisingly most the wines I sampled were from newish vineyards (I skipped the ubiquitous, well established BC vineyards like Grey Monk, Mission Hill, Quail’s Gate, et al)) in favour of trying something new. But with new and unique, comes smaller cases, and limited availability, and unfortunately, not readily available to the consumer. 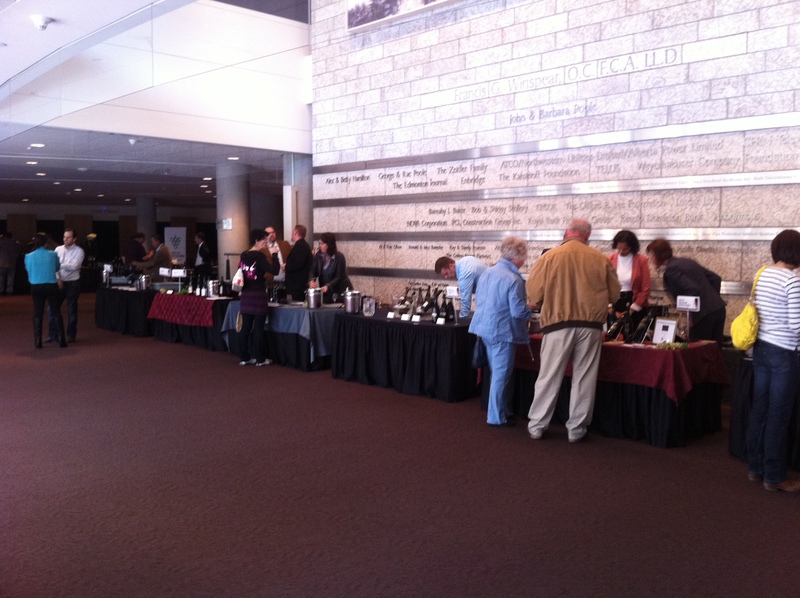 However, the event was very well attended, and hopefully some of the people buying for our favourite local restaurants will pick up my favourite and notables from today: a Gewurztraminer from Baillie-Grohman Estate Winery, a delicious Syrah 2008 from Le Vieux Pin Winery, a soulful Carbernet Merlot from Neck of the Woods, a surprisingly bright and refreshing 2008 Chardonnay from Noble Ridge Vineyard and Winery and a stunningly scrumptious 2010 Barier Scholefield Rose from Okanagan Crush Pad Winery. My pants shrank over Thanksgiving too. Cheap fabric.